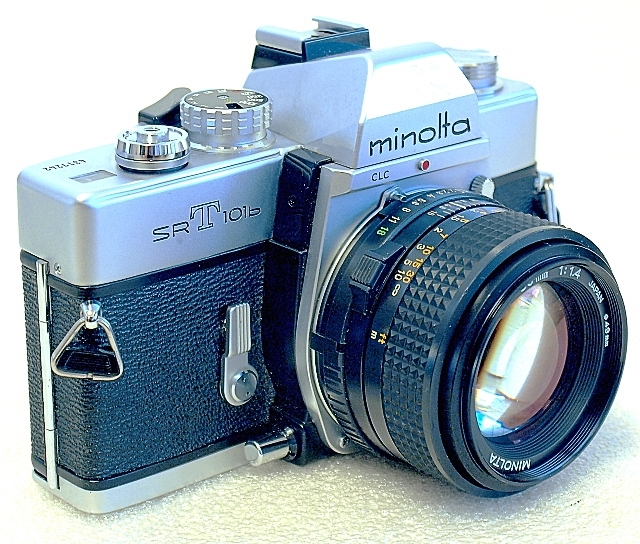 Minolta introduced the SRT series of 35mm SLR film cameras in 1966. First of the line was the SRT-101, a first that came with a full aperture through the lens metering, and a meter coupling system that introduces the MC (Meter Coupled) series of SR mount lenses. The SRT series cameras, well known for its solid construction, are fitted with a double-hinged reflex mirror and has extremely bright viewfinders. Exposure metering is a match needle system where the aperture needle is lined up with the shutter speed setting for the correct exposure. Depending on the camera variant, the viewfinder may also display the lens aperture setting through a small window on top of the viewfinder frame, the shutter speed scale on the bottom of the viewfinder screen, whilst all will have the match needle exposure display vertically on the right of the screen. 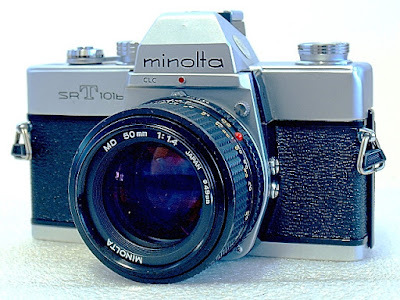 Here's a video tour of my 1967 Minolta SRT-101. I bought this camera off eBay a few months ago, and after running 4 rolls through it, I've seen that it takes amazing pictures. While the SRT series cameras stayed in production for 15 years (till 1981), the general model SRT-101 was replaced by the SRT-201/101b/SR101 in 1976 and again by another variant of SRT-210/101b/SR101s in 1978. 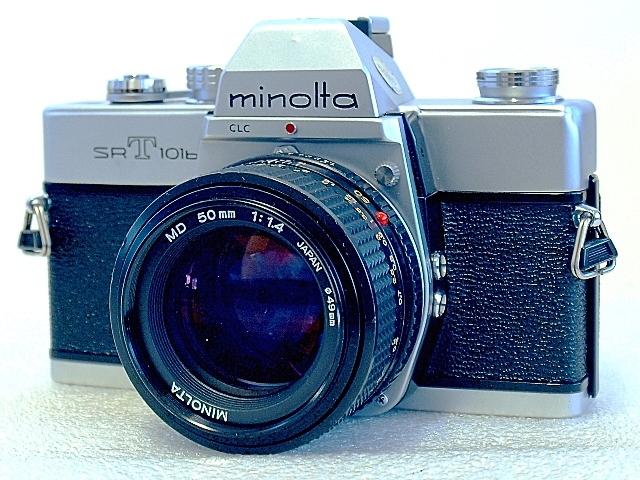 The Minolta SRT 101b, a later variant of the SRT101, was first released in 1976 and stayed in production till the end of the SRT line. The model was also marketed as the SRT-201 and SR101S in various parts of the world. 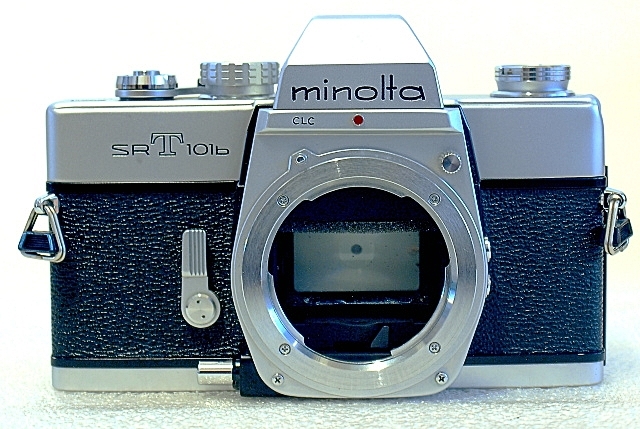 One notable change, towards the end of the SR-T 101 run was the removal of the mirror lock-up feature and the replacement of the flash support with a hot-shoe. Shutter speed range is constant from B to 1/1000 second, film ISO setting from 6 to 6400, and the viewfinder displays only the shutter speed scale at the bottom of the screen and exposure metering needle setup on the right vertical. Unique to the SRT line is the CLC (Contrast Light Compensator) metering system. The system uses a pair of Cadmium Sulfide photocells located one each at the top and bottom of the picture frame, with the lower cell being twice as sensitive. This system compensates for the higher reading of sky areas and gives the image a better overall exposure. 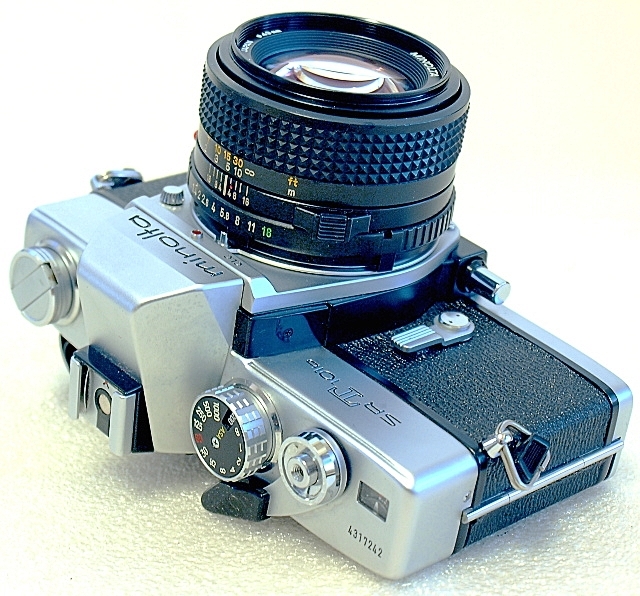 Similar to other models of the SRT line, or even when compared to cameras of other makes, the front plane of the SRT-101b body is rather spartan with the lens housing mount being the major portion. The self-timer lever and switch mechanism are located to the left of the housing and towards the lower part of the housing, the stop-down lever. I think it is worth mentioning that the stop-down lever works only after the shutter has been primed (cocked). One press and the stop-down mechanism is activated, released by either by way of releasing the shutter or giving the lever another press. To the left of the top plane is the rewind crank which is coupled to the pull-up film back release, a hot-shoe on top of the pentaprism housing, and to the right, the shutter speed dial which is integrated with the pull-up and turn ISO film speed selector, the shutter release button sharing the same axis as the film forward crank, and the film frame window towards the right edge of the top plane. The backplane of the SRT-101b is another plane affair with the hinged film back occupying the whole with of the camera body below the top plane housing, which is occupied by only the viewfinder window. 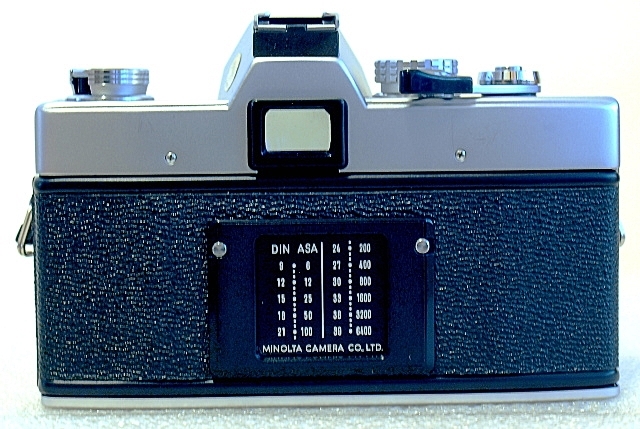 A memo holder with ASA/DIN conversion table is located centrally on the film back. On the bottom plate is the film rewind release button, camera battery chamber with normally a knurled type cover, the tripod socket, and the On/Off/Battery Check switch, again operated by pressing your thumb and knurling to the setting you want to set the switch to. The film box is the standard lining up the film end to engage the sprocket gear and inserting the end of the film tab into one of the tabs on the take-up spool before closing the back and doing the two-blank shots to move the film properly to frame 1. To unload, press the film rewind release on the bottom plate of the camera and turn the film rewind crank clockwise until the fil roll is completely rewound into the film canister. The viewfinder in the SRT-101b is a Matt-Fresnel-Field focusing screen with centered 3mm microprism spot focusing aid, with the aforementioned shutter speed scale on the lower part of the screen, and the match needle pointers on the right vertical of the viewfinder frame. The straight needle is the aperture opening which corresponds to the aperture setting on the lens, while the balloon end is the shutter speed indicator. Aligning the two needles together can be done in either by shutter or aperture priority exposure measurement. The two pyramid shapes flanking the needle movement indicate the limit of the exposure reading, and the square box is the needle rest point showing sufficient battery power is available when doing a BC (Battery Check). Unless and otherwise you are using non-MC (Meter Coupled) or the later version MD lenses, metering is always done at full aperture by the TTL metering system. Stop-down metering is only done for non-MC or MD lenses or when the camera is fitted with a reverse ring setup or other contraption where the auto aperture connection is not available. 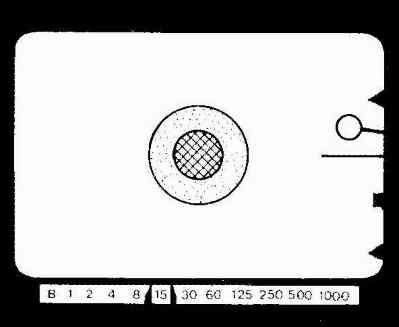 When used with MC or MD lenses, the stop-down mechanism of the camera is mainly used for DoF (Depth of Field) preview. The SRT-101b requires a 1.35V mercury battery, an Eveready EPX-625 or equivalent. Since these batteries are not available anymore, I make do with a higher voltage (1.5V) LR or SR 44 cell and a stop reduction on the ISO film speed setting. With a hefty body weight of 690 grams without lens, and a body dimension of 145 x 47.5 x 95mm, the SRT-101b is definitely a bulk that needs some getting used to. It is, however, a delight to use. My test unit, at over 30 years old, is still functioning properly with film forward, metering and shutter actuation are all smooth and dandy. The only adverse, if I may say, is the dirt and dust collection that is pertinent across a few units I was familiar with, within the prism head that needs the proper service of an expert for it to be properly cleaned and looked after. A CLA, of, wouldn't do the camera any harm.